On March 16, 1521, the Portuguese explorer Ferdinand Magellan (from which Magallanes Street was named after), working under the auspices of Spain, rediscovered the Philippines (named so in honor of King Philip II). 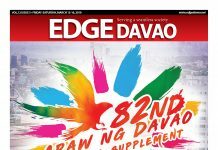 But it was not until on February 2, 1543 that the first documented arrival of the Spaniards on Davao soil, according to davaoofthepast.com (most of the information contained here came from this website). Five years later, in 1848, an expedition of 70 men and women headed by Jose Cruz de Uyanguren led to the establishment of a Christian settlement in an area of mangrove swamps (now called Bolton Riverside). A year earlier, San Pedro Cathedral was built in the same spot where it is located now. At that time, Davao was ruled by a Muslim-Bagobo chieftain named Bago, who had settlement on the banks of the Tagloc River (today’s Davao River). For the uninformed, Datu Bago Awards is named after this man. “Datu Bago was the most powerful datu in the area at that time,” the website noted. What happened next is sort of a script out from a movie. “Cruz de Uyanguren has orders from the higher authorities in Manila to colonize the Davao Gulf region, which included the Bagobo settlement on the northern riverbank. But in the end, Cruz de Uyanguren was able to defeat Datu Bago. “After Cruz de Uyanguren defeated Bago, he founded the town of Nueva Vergara, the future Davao, on June 29, 1848,” Wikipedia chronicled. Then, the Americans came in the 1900s. “Private farm ownership grew, transportation and communication facilities were improved, paving the way for the region’s economic growth,” the website said. It was at this time that Davao became a producer of exports, particularly abaca, copra and lumber. “(Davao) became a port of call for inter-island shipping, and began commercial links to the United States, Japan, Australia and elsewhere,” the website said. From 1903 to 1914, the region was one of the districts of then known was Moro Province in Mindanao. But before 1914 ended, the American colonial agency replaced the name and called it Department of Mindanao and Sulu, which spanned the entire Mindanao island except Lanao. It lasted for six years. With a land area of more than 20,000 square kilometers, the province was one of the largest at that time with Davao City as its capital. Then, World War II broke out. “On December 8, 1941, Japanese planes bombed the city and the Japanese occupation began in 1942,” the website said. During the World War II, Davao was among the regions in the Philippines to be subjected by Japanese occupation. In 1945, the American and Philippine Commonwealth forces liberated Davao from the Japanese. “World War II brought destruction to the new city, and set back the economic and physical strides made before the Japanese occupation,” the website claimed. In 1967, the province was divided into three provinces: Davao del Sur, Davao del Norte and Davao Oriental. Davao City remained as the regional center. Two more provinces were carved out from these provinces: Compostela Valley (soon to be named Davao de Oro) and Davao Occidental. Today, Davao City is known as one of the biggest cities of the Philippines. It has a total land area of 2,443.61 square kilometers.